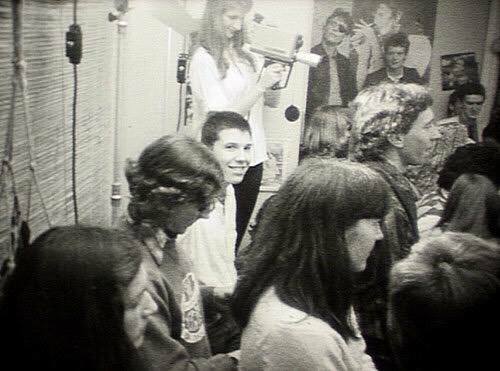 Kim Beissel at a party in St Kilda, 1978, watching Tsk Tsk Tsk play. Also in shot: Tanya McIntyre, Maria Kozic, Linda Baron, Mick Harvey & possibly Harry Howard. Photo still from 'Big Risk'. Born 1960, and raised in Highett, Kim Beissel watched the Boys Next Door from very early days, from their school gigs to the Tiger Lounge. Kim played sax in the second line-up of Crime and the City Solution, followed by Precious Little, some one-off ‘Little Bands’, The Connotations, Hot Half Hour, and Tsk Tsk Tsk. He was a frequent audience member and performer at the Ballroom and the Clifton Hill Community Music Centre, was a presenter on Triple R FM between 1979–80, and studied music, film and theatre. From the mid-1980s, he began singing in bands including The Whites, Fallen Angels, Mouse, and The Sunday Kind. Later he compiled the CDs Original Seeds: Songs that inspired Nick Cave & the Bad Seeds.